Paul Revere's house, in Boston's North End, is an intimate museum of domestic life in 17th-century Boston. American patriot Paul Revere (1735-1818) was a silversmith, bell-caster and revolutionary agitator, but he is most famously remembered for his "midnight ride" "through every Middlesex village and farm" to warn colonial Americans that a British expeditionary force had set out "by sea" from Boston. The "Regulars" landed in Charlestown, and were on their way through Middlesex County to Lexington and Concord to sieze arms and ammunition stored there by the colonial "Minutemen" militias. 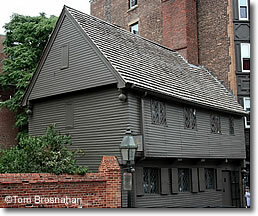 Paul Revere's house in Boston's North End (map) is well worth a visit. It's the oldest extant house in Boston, and is a suitable museum of the age in which Revere and his revolutionary friends worked for independence from British colonial rule. Revere was an important figure in the American revolution, but it was Henry Wadsworth Longfellow's poem, "Paul Revere's Ride" (1863) that assured Revere's place in the pantheon of American revolutionary heroes. But he got the word out, which others then carried to all the towns and villages in Massachusetts and beyond. The Paul Revere Memorial Association maintains the Paul Revere House...and the memory of the great patriot who once lived in it.